NextSailing triumph, the Boxing Kangaroo and the America’s Cup ! In his ‘Meditations’, Marcus Aurelius Antoninus simply wrote or described himself as ‘a male, mature in years, a statesman, a Roman, a ruler.’ He was indeed, a Roman and a ruler, in fact, he was the Emperor of the Roman Empire during the period of 161 to 180 A.D. He was the last in a succession of Roman rulers who presided over the most glorious days of the Roman Empire that spanned from 96 AD to 180 AD. Historian Edward Gibbon, in his ‘Decline and Fall’ nostalgically remarked, “If a man were called to fix the period in the history of the world during which the human race was most happy and prosperous, he would, without hesitation, name that which elapsed from the death of Domitian to the accession of Commodus.” As romantic as this might sound it wasn’t entirely true. Marcus’ reign was unfortunately seriously troubled by a series of natural disasters such as plagues, floods and famines as well as by conspiracies, corruption and barbarian invasion, particularly from the Danube. But what the period does best reflect is the overall good governance that was carried out by Nerva, Trajan, Hadrian, Antoninus Pius and Marcus Aurelius as the ‘Five Good Emperors’. Although he had no way of knowing that history would name him as one of the ‘five good emperors’, what Marcus Aurelius wanted more than anything was to rule like his predecessors. Growing up in the Antonine Age, he was given every opportunity to follow in the footsteps of his predecessors. He was trained as a kindhearted administrator, living and ruling by the principles of Stoic philosophy that he very much admired. Unfortunately what he got was a never ending cycle of violence on the frontiers. This however did not deter him as he courageous accepted the role that the Roman gods had chosen for him and gathered up his armour and rode to the defence of the empire. Beginning around 164AD, Marcus Aurelius was immediately on the back foot fighting the Parthian War over the disputed regions of Armenia and Upper Mesopotamia. 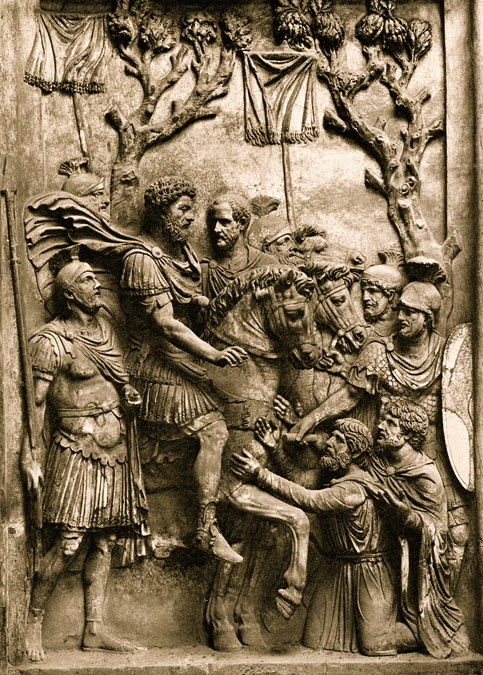 Aurelius ordered his colleague and co emperor Lucius Verus to command the legions against the Parthians. (Marcus Aurelius and Lucius Verus were both the adopted sons of the previous emperor Antoninus Pius. When Marcus Aurelius inherited the imperial throne, against all expectations he nominated Lucius as co-emperor. This audacious move was an event that had no precedent in the principate.) With no end in sight, it would be five years before the bloody conflict with the Parthian Empire would come to an end. Finally, when Lucius Verus returned to Rome in triumph, his legions would bring back with them a plague that would ravaged the empire. In a weakened state, the empire fell victim to new incursion from Germanic tribes who crossed the frontier at will. Another three years would pass before Aurelius, in 169 AD, would have enough strength and resources to deal with the Germanic invaders. Aurelius would subsequently spend the next eleven years of his life fighting on the northern frontiers. (Lucius Verus would die of a stroke on the frontier in 169AD). During those years on the front he also faced another crisis that came in the form of an usurper general named Avidius Cassius. This crisis forced him to compromise his plans to expand and annex new territory. Fortunately, the threat was short lived and he managed to re-established his authority. Later, together with his son (who he made co-emperor in 177 AD) they would doggedly fight the empires northern enemies along the Danube until his death in 180 AD. Marcus Aurelius granting clemency to Germanic prisoners during his wars on the northern frontiers. It is important to note that Marcus never intended to publish his works or journal. It was silently meant to be for his eyes only. In a nutshelf Marcus was writing a series of reminders or quotations (to himself ) on how to strive to live a virtuous life. This approach to life meant that Marcus Aurelius was a tolerant individual. But he wasn’t perfect, everyone including Marcus had their flaws. He was on occasional accused of being more concerned about the stoic ideals of perfection, than he was with pressing issues of the empire. One of his greatest failures was not continuing the successful practice of adopting a worthy Roman to oversee the good governance of the empire. It was a choice that future generation of Romans would rue. In short, Marcus Aurelius’ son would undo all his gains and plunge Rome into a period of military anarchy. Yet despite Marcus’ poor judgement of his son’s ability to rule, he is still nonetheless remembered as one of the most important figure in Roman history. He is often also cited as one of the greatest emperors that ruled Rome. “Waste no more time arguing about what a good man should be. Be one.” – Marcus Aurelius, Meditations. Great article. Marcus Aurelius was a man of uncommon wisdom, and one of my favorite figures from the classical world. He was a hypocrite and persecuted Christians. Well weren’t all the Roman emperors. Btw, have any of ya’ll noticed how the emperors that are referred to as “good” in the sources are the ones that were good to the senate? And all of our sources for the emperors were written by people of the senatorial class… do you see a connection? You’re right to bring this up, and any persecution of a minority ought not to go ignored. It’s important, though, to consider Marcus’ actions in context. One contextualization that caught my eye is this: Christians, as a whole, rejected the emperor’s divinity, and so were viewed as a seditious fringe group, who could have undermined the political and religious foundations of the empire. It doesn’t excuse Marcus any more than the Crusaders could be excused for slaughtering untold numbers of Muslims, but it is worth considering. Thanks for this post – he’s my favourite emperor! Made my day! At my college I teach both gen-ed history surveys and courses on ancient history. I try to fit him into as many courses as I can. The students LOVE him as an emperor. The fact that it’s so hard to figure him out and his philosophical book catch their attention! It is not entirely true that the co-governship of Marcus and Lucius was without precedent. In fact, Tiberius had already envisioned to divide the rule between Caligula and Gemellus. His intention was ignored after his death, however, and only Caligula succeeded him. I recently read Meditations. Marcus Aurelius sometimes finishes books saying that he’s writing between Germanic barbarians, in the thick of the war campaign, hundreds of miles away from Rome, in the winter, surrounded by legions and, at the same time, alone in the solitude of his meditations. He wasn’t a philosopher from Starbucks.